Survivors of Super Typhoon ‘‘Haiyan’’ (‘‘Yolanda’’) recalled their terror and loss while gathered Thursday at a mass grave for thousands killed five years ago in the country’s worst storm on record. STILL GRIEVING. 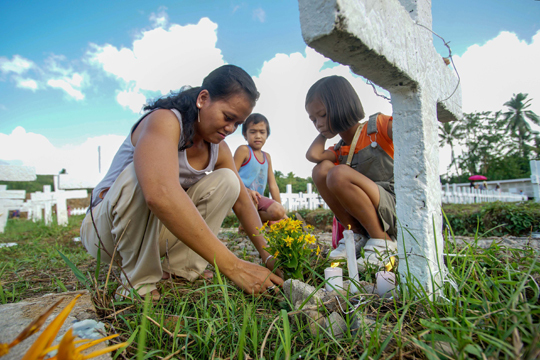 A survivor of Super Typhoon ’Haiyan‘ (’Yolanda’) places flowers and candles at the grave of a relative at the mass grave for victims of the typhoon on the fifth anniversary of the typhoon in Tacloban City, Leyte province, central Philippines on Nov. 8, 2018. The super typhoon struck in the predawn darkness of Nov. 8, 2013 as the then strongest typhoon to ever hit land, leaving more than 7,360 people dead or missing across the central Philippines. Then the strongest storm to ever hit land, Yolanda left more than 7,360 people dead or missing across the central Philippines with its tsunami-like storm surges wiping out communities and triggering a global humanitarian response. “I felt like it was the end of the world. It was like I was in a washing machine, a whirlpool. I was so afraid,” Amelita Gerado, 49, as she described the giant wall of seawater that swamped her home. “There is still pain, a scar, but we are recovering,” said the woman, whose brother-in-law was among those killed in Tacloban. The city government has declared Nov. 8 a “day of remembrance and gratitude” to mark the devastation wreaked by the 2013 typhoon, which highlighted how little-prepared the disaster-prone Southeast Asian nation was for disasters of that magnitude. But Yolanda remains the most powerful, with gusts exceeding 305 kilometers (190 miles) per hour at first landfall. Of the target 205,128 permanent houses for those living in so-called danger zones, only 100,709 have been built, President Rodrigo Duterte’s government said. “We are addressing issues that cause the delay, which include limited availability of titled lands for resettlement, slow processing and issuance of permits,” Duterte’s spokesman Salvador Panelo said on Wednesday. For many whose relatives remain missing, the absence of their loved ones’ remains is also a lingering challenge. “We just put gravestones here even if we are not sure their bodies are here, just so we have somewhere to light candles. I want to honor their memory,” said Michael Ybanez, who lost his mother, sister, a nephew and a niece in the tragedy.